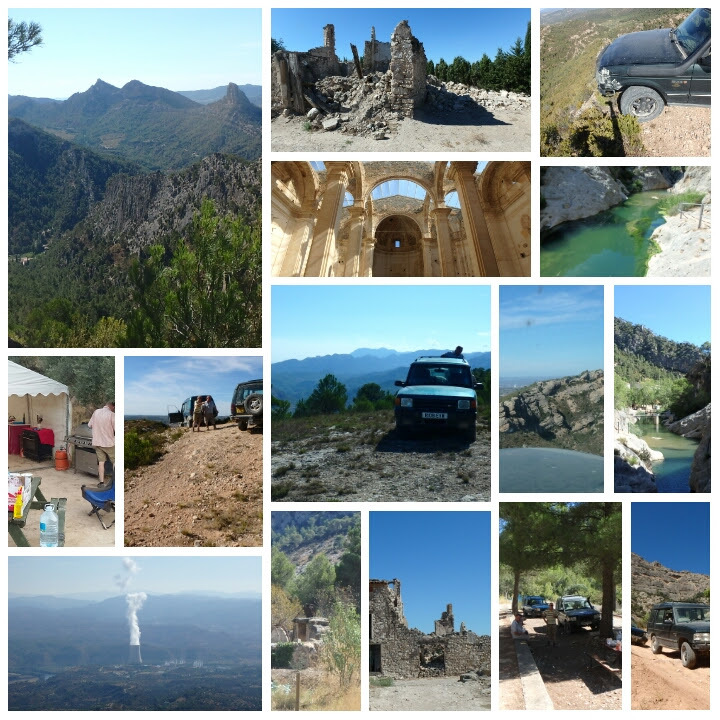 RustyDaytrips.nl: No rain in Spain. To the Disco! No rain in Spain. To the Disco! We'd heard Spain could be one of the best places to explore unpaved roads and old abandoned villages. But where do you start? Luckily we found Savi and Phil of Spanish4x4.com. 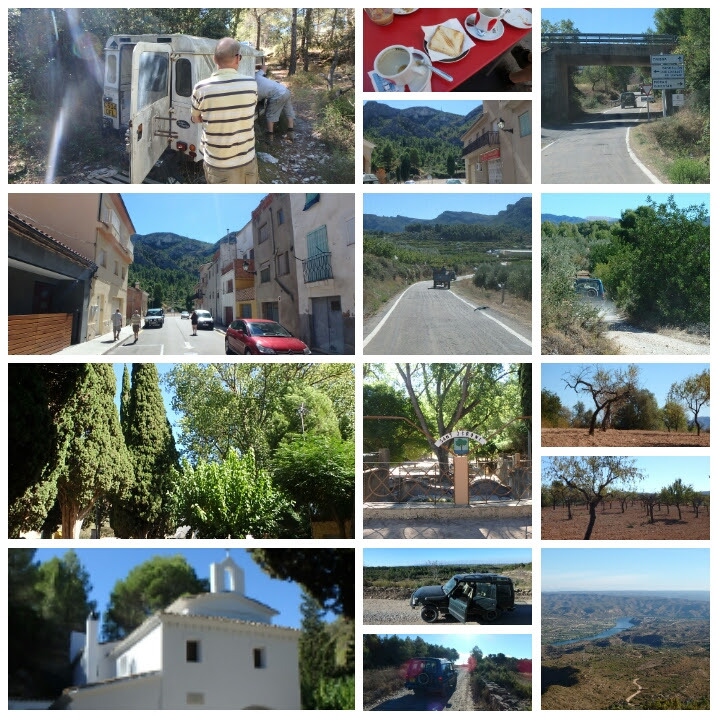 They provide tag along holidays from their base camp near the little town of Riba Roja D-Ebre in Catalonia. So we booked one of their Landrover Discoveries for tag-along and a cabin. They operate on a "day on and a day off" basis. This means you explore on your own on the "off" days and on the "on" days you tag along with Phil and Savi on some of their routes. 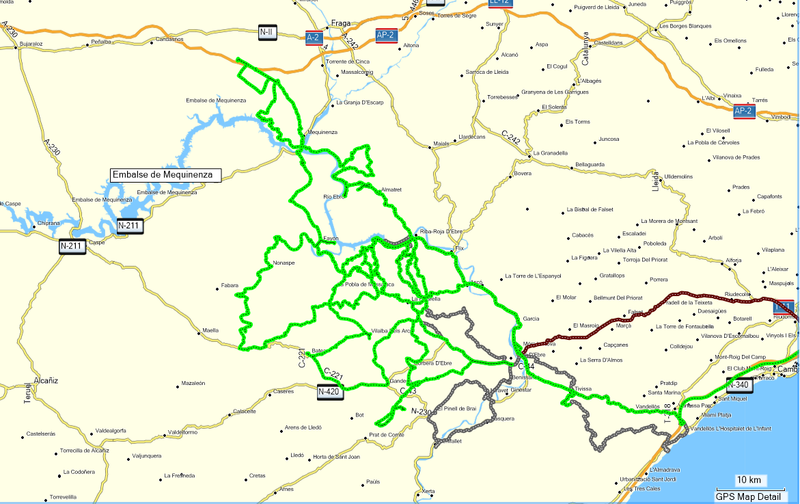 We found these routes to be beautiful and adventurous. 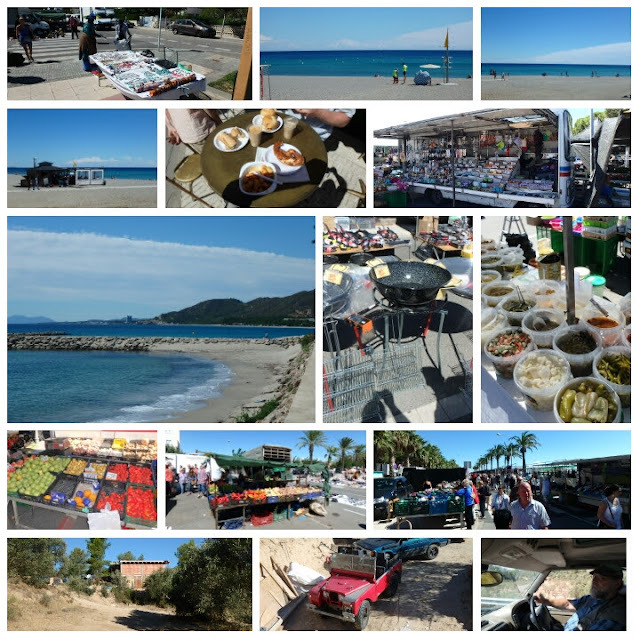 As they say:"Awesome"
Our first day(Sunday) was an "off" day, but as we needed supplies we were shown the way to a local market in the town of Hospitalet de l'infant. After the market we took a scenic route back to try the Discovery that would be our vehicle for the next week. Next day the first of the guided runs took us from the hills to the sea side. 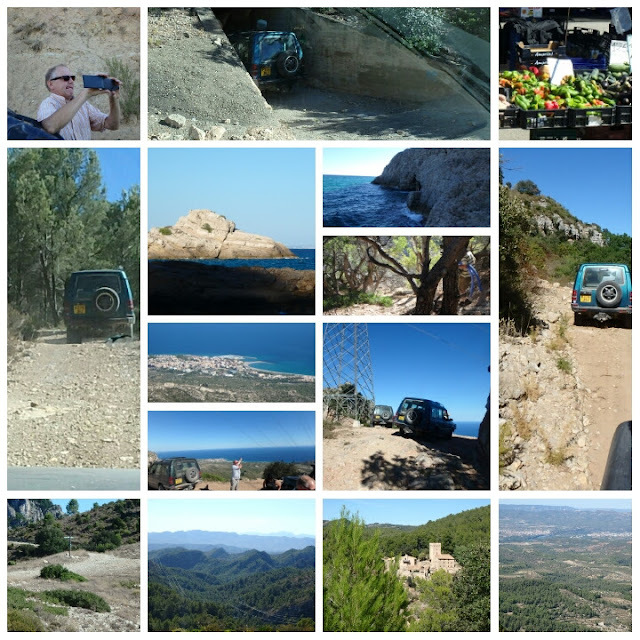 We explored some passes and an exciting climb up to a stunning seaward view. 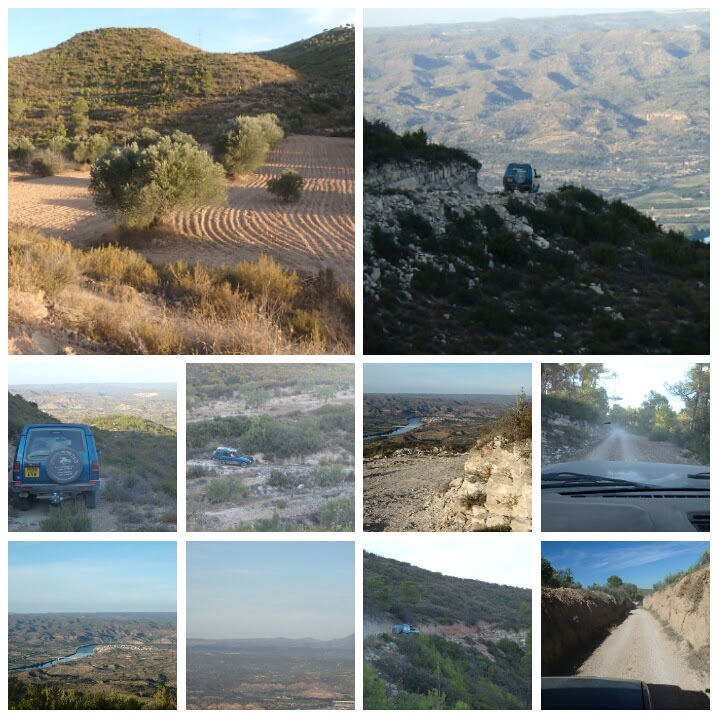 We passed through olive and almond groves. 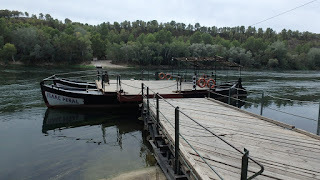 The ferry took three cars. Our Disco was last. 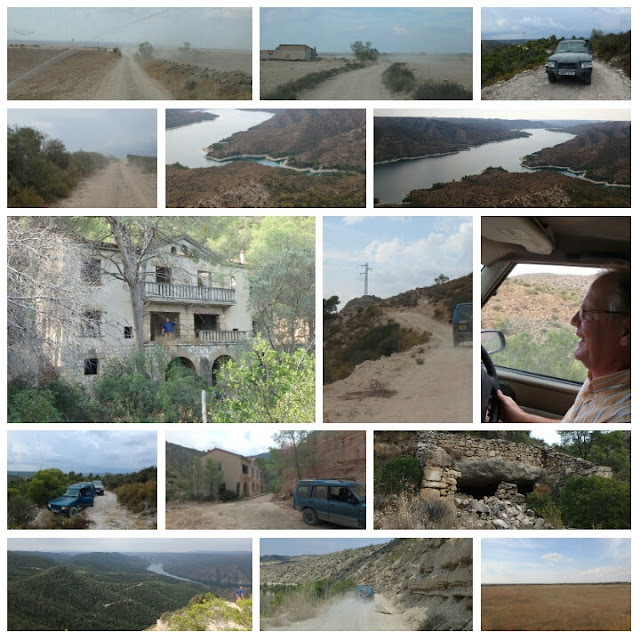 One of the most impressive stops was the town of Corbera d'Ebre. 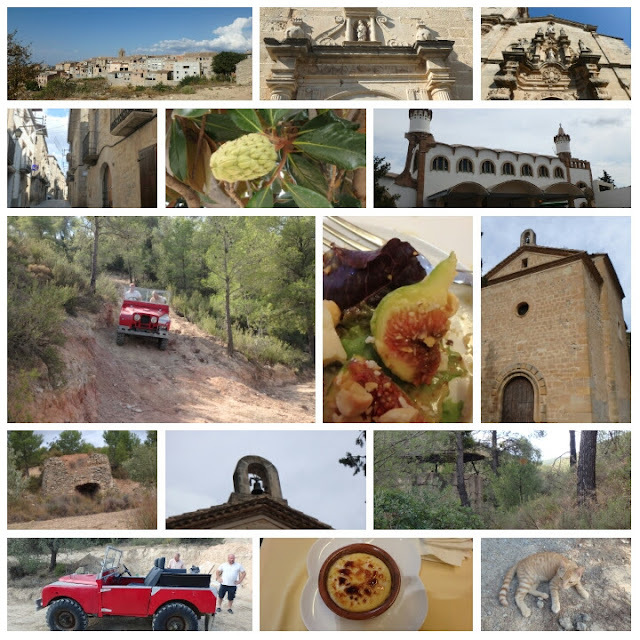 This town was completely destroyed during the Battle of the Ebro (25 July–16 November 1938) and although the lower part of the town was rebuilt, the upper part, known as Poble Vell (Old Town), including the old church on the hill, has been kept as a reminder. Parking the Discos on a cliff to pose for photos turned out to be a bit of a challenge too. 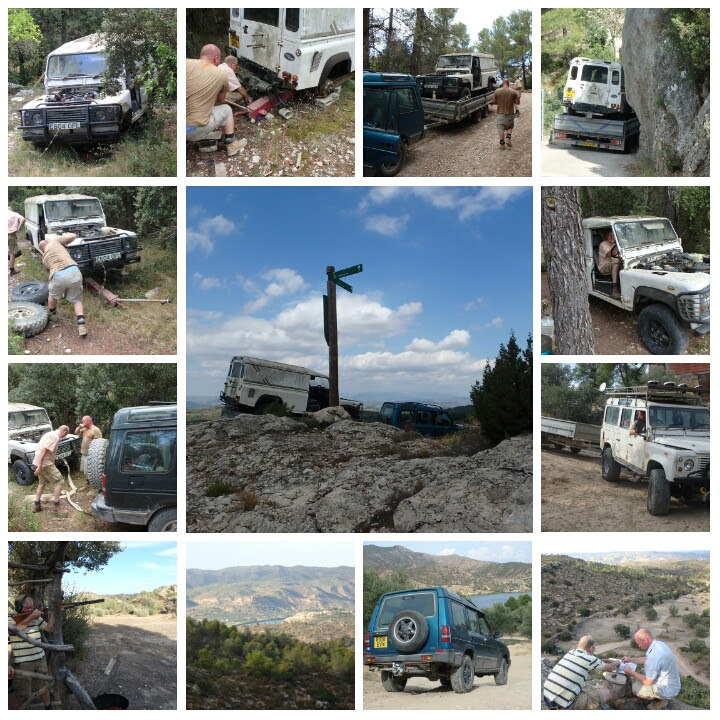 On one of our "off days" we were invited to help extract an abandoned Landrover. After the extraction some clay pigeons were chased from their nests. Back on the itinerary we were shown an a abandoned cement works and an unfinished set of buildings that might have been designed as a private mountain resort. 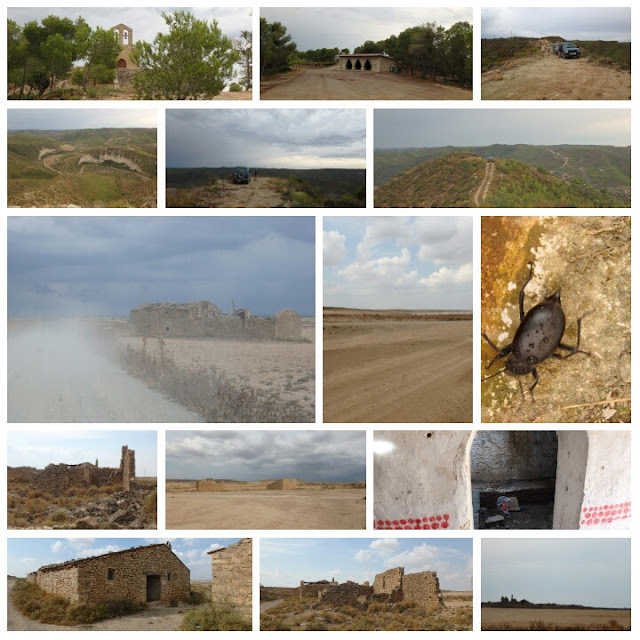 Desert day: more abandoned buildings and very fine dust. 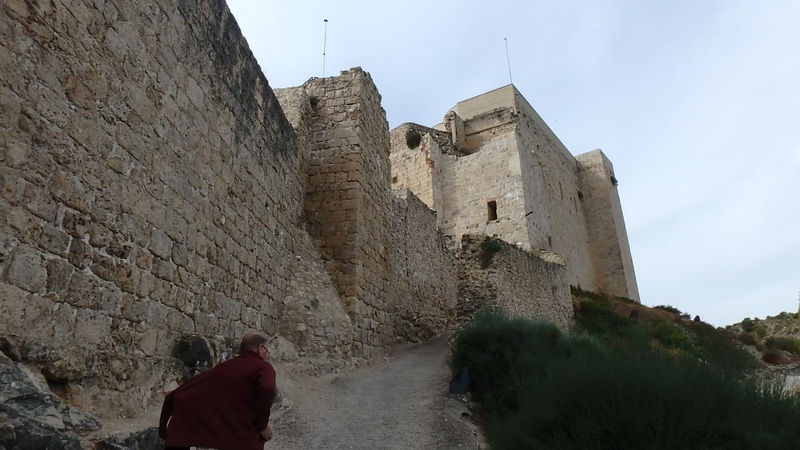 But also a Roman road and another steep climb. Sunken church and more dust got us ready for Tea. 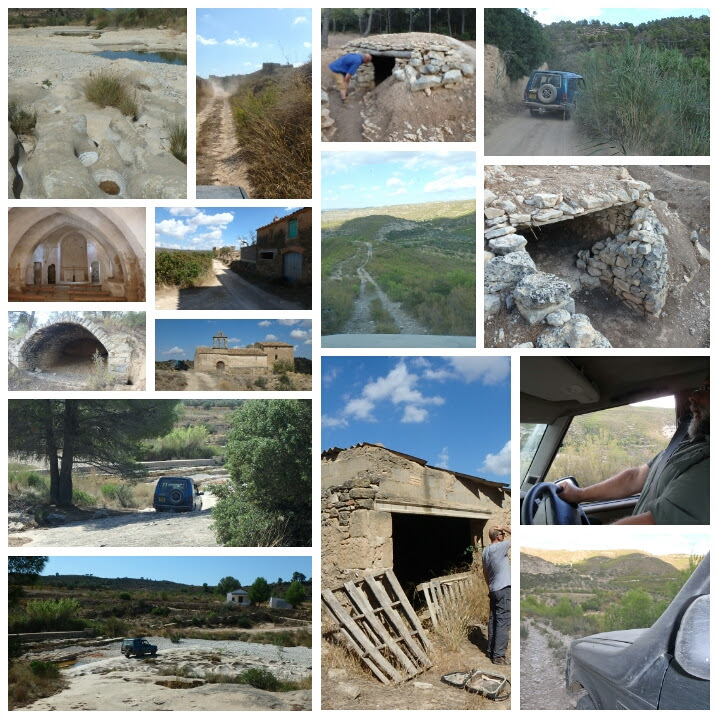 The abandoned village of Pinyeres, rocks a and civil war trenches. 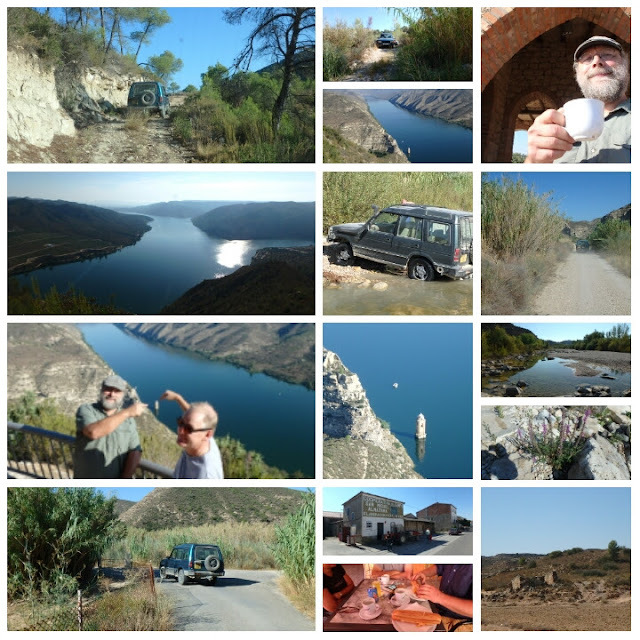 On our last day we were treated to an exciting ride in the 1950 Series one Landrover and we took a last tour in the Discovery to Fatarella, Gandesa and Vilalba dels Arcs.